Magic and mystery abounds in this intensely plotted novel, full of evocative phrases and creative turns. 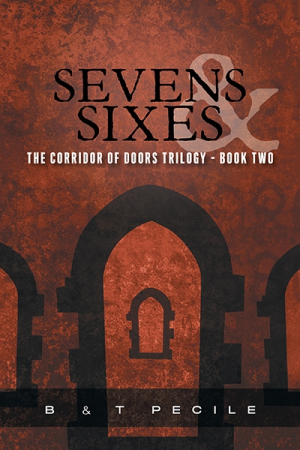 Sevens & Sixes, by B and T Pecile, is the second book in the fascinating Corridor of Doors Trilogy. In this story, Khia, a young woman with an extraordinary and mysterious power, must escape the Vatican and the corrupt officials seeking to control her and her friends. As she sets out on a long and often convoluted journey, a plethora of magicians, mercenaries, ghosts, and demons stand in her path, ready to help or hinder her. Khia has found sanctuary at the Vatican, but sanctuary does not mean safety. Two old friends show up and instruct her to flee to the Abraxis and to take The Book with her. With the help of her friends Catherine, Norbert, and McBride, she is able to decipher this cryptic message. The group identifies the book as Ab Comissio Occauss Aborior, the name of which is not to be spoken aloud. They remove it from the library and make their escape to search for the Abraxis, a ship that will assist them on their journey. As Khia and her friends flee across the sea and through the desert, Khia learns more about who she is and the power she possesses. Sevens & Sixes is a unique and creative story. There is a great deal of action as Khia’s friends fight off the evil forces that would control her, making for an exciting and often intense plot. The novel includes a large cast of characters, all with interesting backstories and subplots of their own. This second installment of the series, however, contains very little information about the events of the first book. As such, there is a lack of clarity concerning the relationships between the primary characters and what, exactly, they are trying to accomplish. Similarly, some of the minor characters appear and disappear without context, and previous events are alluded to but not explained. This is true of elements like Khia’s totem pendant, which seems to play an important role that is not detailed in depth. Sevens & Sixes is exciting and interesting, and young adults looking for something new will appreciate its fresh world and characters.